Orange Roughy, Hoplostethus atlanticus, is a large deep-sea fish found in both the Atlantic and Pacific Oceans. Like many deep-sea vertebrates, it has a very long life history, taking several decades to reach maturity and living for 100 years or more. Orange roughy occur at abundant on seamounts, making them prime target for deep-sea trawlers. 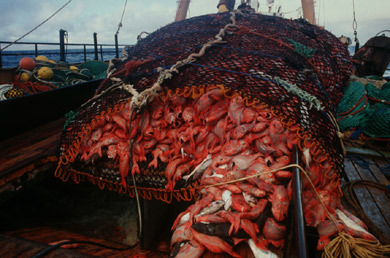 About 25 years ago, Orange Roughy were discovered as an easily exploitable deep-sea fishery. Roughy were caught in huge numbers to be turned into white fish fillets and served as luxury meals. They quickly became a very valuable fish, but were caught in such great numbers that many catches had to be thrown out to prevent market saturation. It should be no surprise that roughy populations were quickly fished to near extinction. In a 2001 paper, orange roughy populations off the coast of New Zealand were assessed to determine if responsible management could allow the roughy to recover while still supporting a fishery. The results were promising but inconclusive. Some populations showed signs of recovery, but others were still declining. The orange roughy life-cycle makes it incredibly vulnerable to exploitation, so why is this fillet wrapped in the trappings of sustainable fisheries? 'Wild caught, Pure, All Natural"
Full Circle is Lowes Food’s eco-brand. They sell everything from diapers to seafood, all in packaging that screams all-natural and environmentally friendly. Some of their seafood bears the stamp of the Marine Stewardship Council. What immediately caught my eye was the statement that their roughy were harvested from healthy runs. What exactly is a run of deep-sea fish? This deceptive labeling reads as though someone took the copy from their Salmon packaging and replaced “Salmon” with “Orange Roughy”. Regardless, the label is false advertising because there is no such thing as a roughy ‘run’. The packaging point consumers to their website for more information. 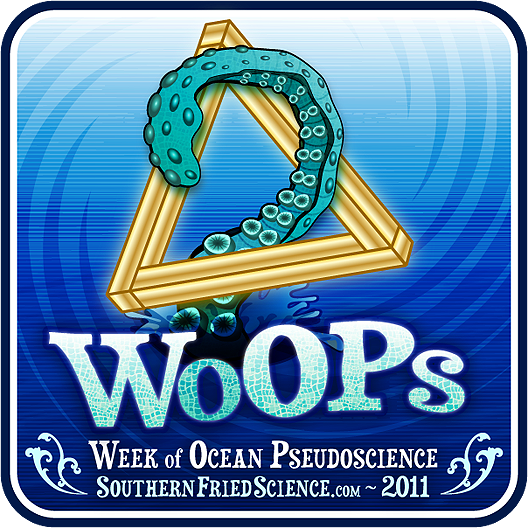 If there is any actual information about the sustainability of their individual seafood products, 3 veteran bloggers could not find it. More importantly though, is the claim that the roughy is fished from a healthy source and that this product somehow exists under their umbrella of sustainability. Can there really be such a thing as sustainable orange roughy? Despite attempts to fish at maximum sustainable yield (don’t worry, we’ll be addressing MSY later this week), the New Zealand fishery has continuously overestimated and revised it’s catch quotas. Orange roughy is listed as conservation dependent by the IUCN. Many retailers refuse to stock the fish. The world’s largest container shipping company has declared that it will not transport orange roughy (along with several other over-fished species). Even Red Lobster has a franchise-wide ban on serving Orange Roughy. As it stands now, orange roughy is not a sustainable fishery. There may, with wise, informed management, be a future for orange roughy on the dinner table, but that future is not here yet. For a company to market orange roughy as a healthy, sustainable fishery is simply greenwashing. UPDATE: Twitter user @highlyanne has sent in a picture of the text from the back of a Full Circle Wild Alaskan Salmon packet. As suspected, the text is identical, with the exception of changing Salmon to Roughy and updating the location. Guess we know where the “run” came from. See for yourself! UPDATE 2: After checking my local Lowes Foods, it appears that the packaging for Orange Roughy, Salmon, Cod, Halibut, and Swordfish all have the exact same wording, with changes only to the names of the fish and the location. Greenwashing - Is there really a sustainable Orange Roughy fishery? And you could ask the same question about MSC certified fisheries for Patagonian toothfish…a deep sea species that plays a really crucial role in a vulnerable ecosystem (one of the few that we haven’t completely trashed yet). After reading this, I went looking for a guide to help when I’m in a restaurant or supermarket. Any favorites? I found Seafoodwatch from Monterrey Bay Aquarium. Can anyone endorse this site or any other? I love seafood, but I love the oceans more. Seafood Watch is pretty solid. 1) Even though it says it is orange roughy…could they just be stealing the name to sell some other less enticing white fish fillets? 2) If people really are concerned with sustainable seafood…don’t buy it from the store. I refuse to buy seafood from stores. I catch all my seafood myself…if I didn’t catch it, I don’t have it. The few times I do buy seafood it’s usually directly from true seafood markets or from the dock. Grrrr! Such blatant green washing. Can’t wait for your article on MSY! Ted – Monterey Bay’s card is good, though not without critics. I think it’s overall the best out there for combining good science, clarity etc.